The explosive rise of smart speakers in recent years has been fascinating to watch—and to listen to. In this article, we’ll highlight the recent history of voice technology and take a look at how we’re integrating voice into the publishing industry. The modern era of voice assistants began with Apple’s Siri in 2011. A few years later came Amazon (2014) and then Google (2016), who are now the main players in the smart speaker market, with approximately 65 percent and 20 percent of the market share, respectively—while Siri lags behind at 5 percent. Smart speaker adoption is moving fast. In just four years, smart speakers have gained a user base of nearly 1 in 4 U.S. adults (22.9 percent of the U.S. adult population): 57.8 million adults. In terms of usage, more than 79 percent of users report using the devices monthly, while 45.5 percent use them daily. The rise of smart speakers also means that this technology is catching up to—and will soon surpass—smartphones as the device where users listen to audio content most frequently. 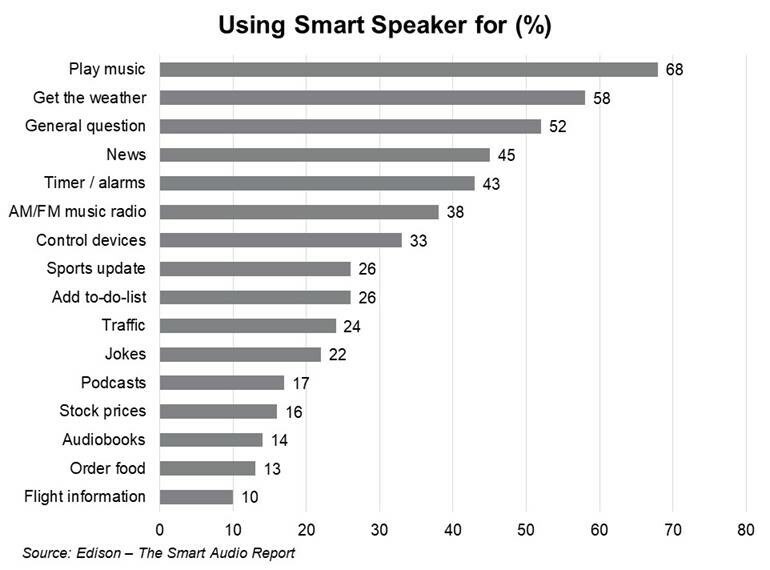 The type of content mainly consumed on smart speakers is still fairly basic: the most common requests are to play music, get the weather, answer general questions, check the news, set an alarm, and check the time. This makes sense given that voice intelligence is still at an early stage, and users are not yet as familiar with the technology as they are with that of other devices. Penguin Random House began experimenting in the voice space about two years ago with Mad Libs, the popular children’s activity books. Penguin Young Readers adapted the World’s Greatest Word Game to allow users to fill in the blanks and complete stories using their voice. The experience is live on both the Amazon Echo and Google Home, and the team behind this skill is currently working on an update to support other recently announced devices. In late 2018, PRH went live with a second skill, Good Vibes, which provides a daily dose of inspiration through uplifting motivational quotes from bestselling books and authors, including Mindy Kaling, Lin-Manuel Miranda, Elizabeth Gilbert, Gretchen Rubin, and countless others. Users can listen to as many as three quotes a day, learn more about the featured books, and opt in to receive more information and additional book recommendations via email. Good Vibes was featured as a Staff Pick in the Alexa app and will be updated seasonally as PRH releases new titles. Other brands and media companies are also playing in the voice space to promote existing offerings. Since monetization is still a hurdle, many brands are using voice as a marketing channel for either specific products or an overall brand. Examples range from Jeopardy!, a trivia game where users answer a question in a voice experience that mirrors the TV show, to the Butterball skill, an adaptation of the old fashioned holiday hotline that instructs users on cooking the perfect turkey and includes how-to’s, tips, and recipe inspiration. Other applications from media and storytelling companies include: interactive, on-demand, storytelling experiences for young children such as Megustaescuchar Cuentos (PRH Spain) and Choose Your Own Adventure; trivia and games such as the Astronaut Selection Test (PRH UK), Escape the Room, and the Official Harry Potter Quiz; and recommendation engines for specific audiences, such as MovieBot. Voice technology is still in its early stages, so the ways it will grow and develop are still unfolding. 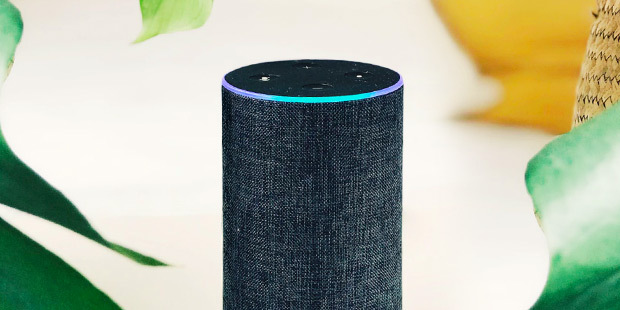 But PRH continues to follow the smart speaker market and find interesting ways to bring our books and authors to consumers, no matter the medium. Matteo Costa is Director of Business Development, Publishing Development and Author Platforms at Penguin Random House.